Morgan City Rentals rigging division offers a complete line of Domestic and Import chain hoists, chainfalls and trolleys. Listed below are a few of the items available. Morgan City Rentals prides itself in carrying products from industry leaders who manufacture premium quality hoists designed for jobs of all sizes. To determine what type and size hoist is best for the job, please contact our sales team for a quick quote. 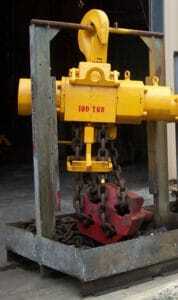 Smaller lifting projects can use air powered hoists depending on the application. These air powered hoists can handle loads from 120 lbs to 7.5 tons. 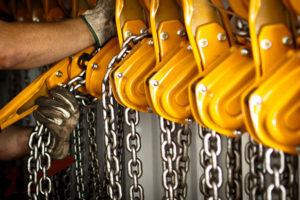 Air powered hoists offer numerous benefits. They are simple to use and require minimum maintenance. Using an air powered hoist is often less expensive than an electric hoist. Also, since they run on compressed air, they do not product any sparks, thus making them explosion and flame proof.